Lexington, KY – May 13, 2012 – Rain plagued the Kentucky Horse Park throughout the day at the Kentucky Spring Classic, but it did not stop the country’s top competitors as they entered the Rolex Stadium for the $75,000 Commonwealth Grand Prix. As the second U.S. Show Jumping Team Observation Event during the show, today’s grand prix event featured a challenging scope test, which only three Olympic hopefuls were able to master. Mario Deslauriers piloted Urico to the fastest clear jump-off to claim the victory, while 17-year-old Reed Kessler placed second aboard Mika with the other fault free round. 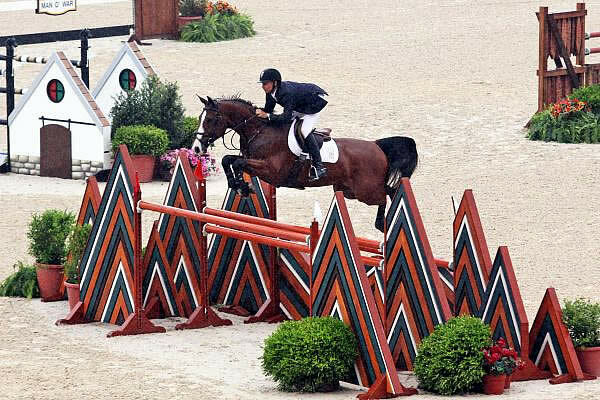 Beezie Madden also advanced to the short course with both Simon and Cortes ‘C’, but placed third and fourth, respectively, after earning four faults with each. The first round of Richard Jeffery’s demanding track included to wide oxers in the first line, followed by an even larger triple bar. There was also an open water to an airy vertical-vertical double combination. Riders then headed away from home through an oxer-oxer-vertical triple combination and finished over a long line with two liverpools. Eight of today’s 16 entries managed to complete the course with just four faults to their name, attesting to the level of the competitors in the ring. Four horses left every rail in the cups and advanced to the short course. Madden and Cortes ‘C’, owned by Abigail Wexner of New Albany, OH, were the first pair to show over the shortened course. They added four faults to their score sheet after making a sharp turn to a tall, skinny vertical. After crossing the finish line in 35.76 seconds, they eventually earned the fourth place award. Madden and her second mount, Simon, the victor from Friday’s $50,000 Hagyard Lexington Classic, improved on the time with a 35.10 second finish, but a rail down in the double combination left them in the third place position. New Lexington, KY, resident 17-year-old phenom Reed Kessler took her turn over the jump-off track with Mika, and with nerves of steel, Kessler once again showed the way and jumped to the top of the leader board with a clear round. They dashed through the finish line in 35.40 seconds, which would be good enough for second place. Mario Deslauriers knew he need a quick round with Urico, owned by Jane Clark of New York, NY, and he also needed to be clear to take the victory. The seasoned pair proved to be up to the challenge though, and they broke the beam at 35.15 seconds, just edging Kessler out of the lead to earn the Sunday victory. Deslauriers is currently ranked sixth on the Long List for the U.S. Show Jumping Team, but today’s win will certainly improve his chances of making the Team for the 2012 London Olympics. Two Observation Events still remain though, at the Devon Horse Show and at Spruce Meadows, and other Olympic hopefuls such as Kessler and Madden will be right on his tail. Some of the four-faulters at the top of the Long List from today’s event included Kent Farrington with RCG Farm’s Uceko, Christine McCrea and Romantovich Take One, and Laura Kraut riding Cherry Knoll Farm’s Cedric. All of these combinations will be looking ahead to compete during the Spruce Meadows or Devon Horse Show Observation Events, as the Selection Committee tries to narrow down the candidates for the 2012 London Olympics. Next week, the competition will continue at the Kentucky Horse Park during the Kentucky Spring Classic, scheduled for May 16-20, 2012. Some of the highlights will induce Thursday night’s $32,000 Hagyard Lexington Classic, Saturday’s $75,000 Mary Rena Murphy Grand Prix sponsored by Audi of Lexington and Sunday’s $20,000 Bluegrass Classic. The $32,000 Hagyard Lexington Classic will be held in the Rolex Stadium, and will offer riders the opportunity to earn valuable points towards the $50,000 Leading Rider Bonus, and will feature $6,000 in bonus money for the SSG Riding Gloves ‘Go Clean for the Green’ promotion.